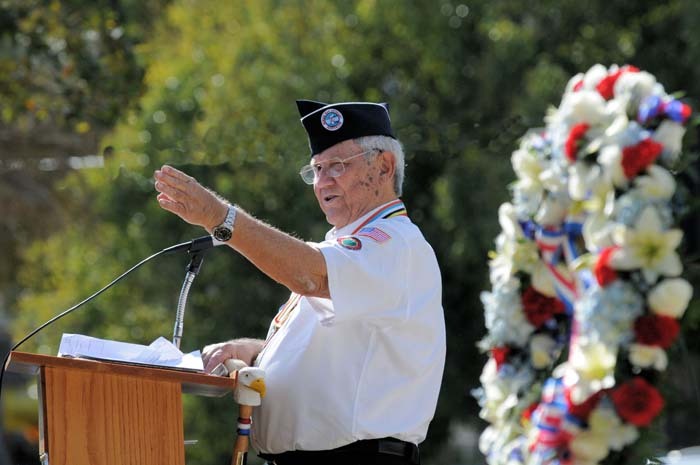 Pentagon Officials Honor Korean Vets! 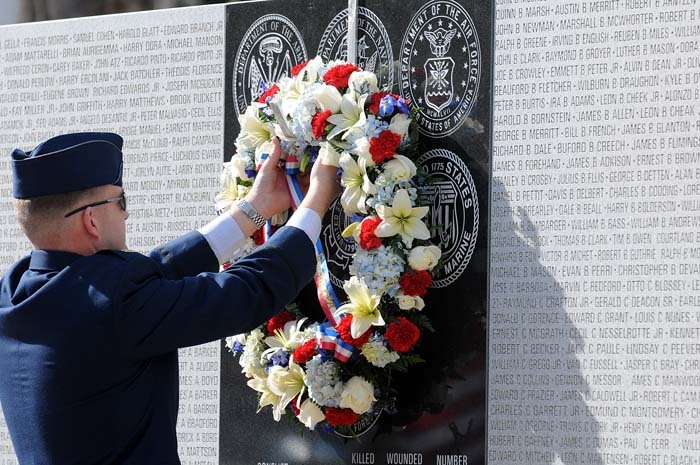 Taps played in the background as Major John "Buck" Buchanan–USAF hung a wreath on the Veterans Memorial at Fountain Park Wednesday afternoon (January 25, 2012), honoring nearly a hundred local Korean War veterans and widows of deceased former members for their service. 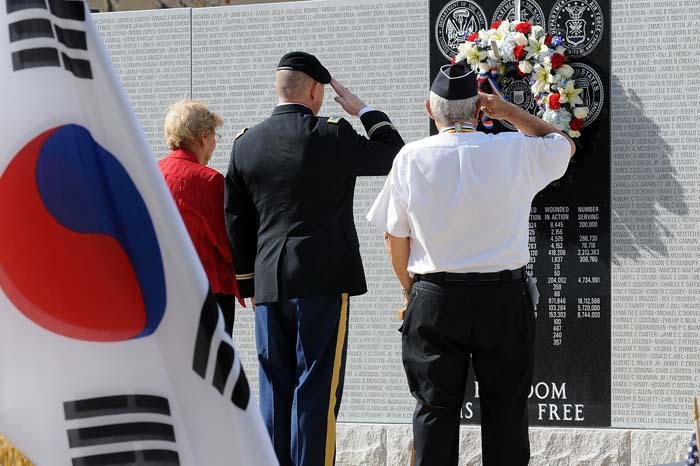 The visit was part of the Korean War Committee's three-year program -- authorized by Congress -- to recognize the sacrifices of these veterans nationwide. Leesburg was the committee's first stop in Florida. 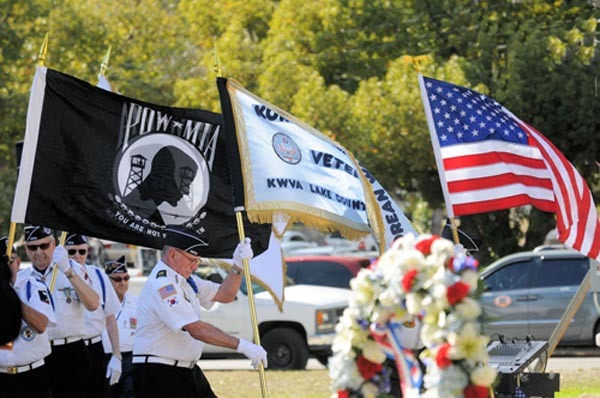 The photo shows, from left, Leesburg Mayor Sanna Henderson, Col David Clark, KW60, and Tom J Thiel, President KWVA Chapter 169, saluting during TAPS. 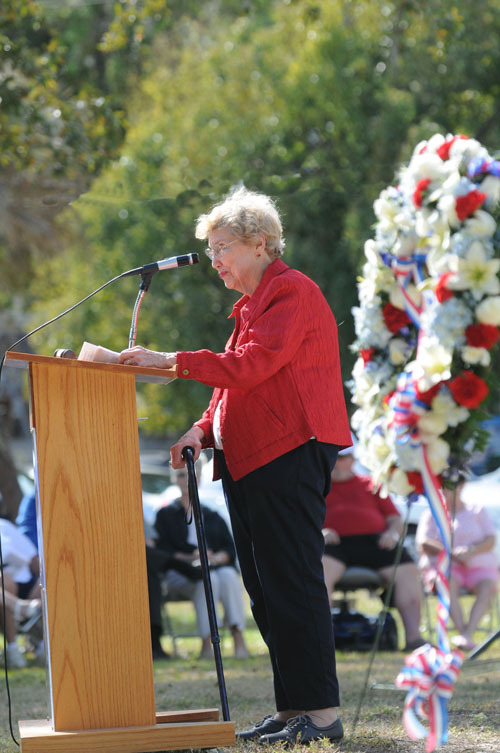 "The service secretaries and chiefs, the men and women of our armed services and a grateful nation, which owes you an non-repayable debt, we thank you for your service," U.S. Amy Col. David J. Clark said to over 250 Chapter 169 members, spouses and guests. 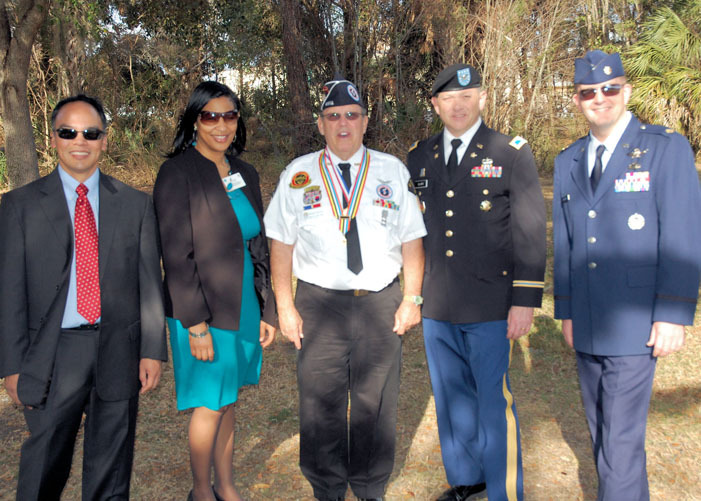 "It is my honor to share this memorable occasion with you and to be in the presence of so many distinguished veterans." Leesburg Mayor, Sanna Henderson, welcomed our KW60 guests and chapter 169 members and guests; She spoke briefly about her recollection of the Korean War. 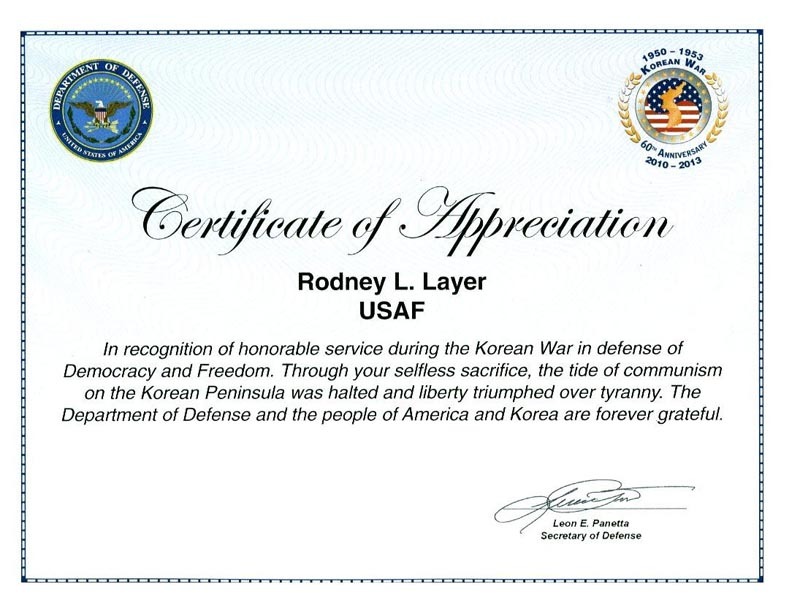 He also said that: "In addition to the beautiful living wreath on the center granite slab, all current and deceased Chapter 169 veterans of the Korean War were being presented a specially-printed frameable certificate signed by Secretary of Defense, Leon Panetta, thanking the member for their service." 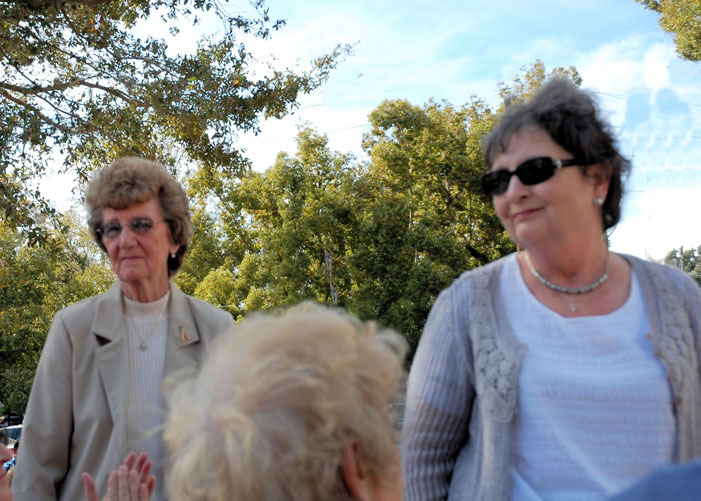 Two of our deceased member's spouses were there for the event; that's Zillah (Mrs. Billy) Gaston of Summerfield on left and Alma (Mrs. G Brooks) Guseman, of Guntersville, AL on right. A certificate was presented to both the deceased member and to the spouse. In addition to Ms. Guseman, Ted and Marie Morford also came from a great distance, Nashville, TN. Ted is a Life member of Chapter 169. 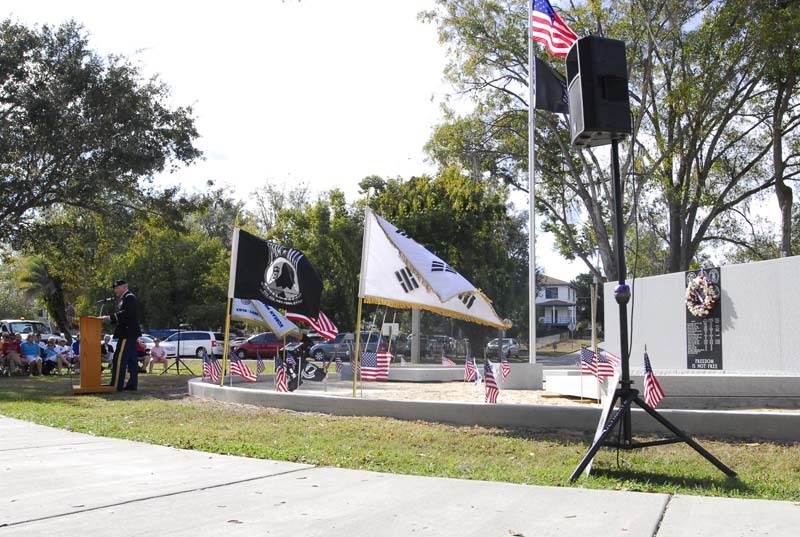 Ted placed all the smaller U.S. and South Korean flags ringing the memorial; we urgently need a member or two to place these flags since Ted is so far away. Chapter 169's Color Guard proudly displayed the colors to begin the ceremony. Member turnout was quite good, there were relatively few certificates not presented. Some of these have been mailed to those distant from here; the remaining certificates will be available for pickup at Member Meetings. 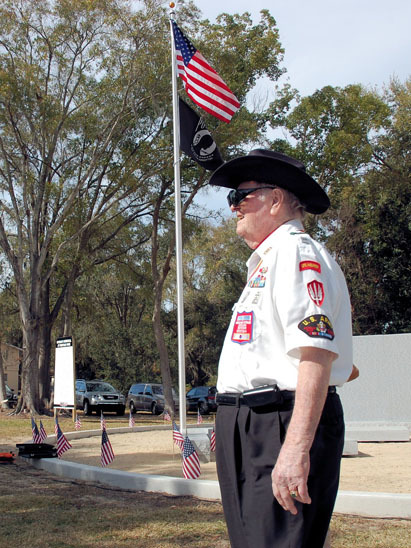 We thank Don Van Beck who contributed so much to ensure that the Memorial was so presentable, and for the flags, and chairs. We thank the Leesburg City employees for the sound system, the first 100 chairs, and the rush order for another load for the overflow crowd. And we are very sorry if we failed to acknowledge everyone that ought to have been recognized. Please also see the January 2012 issue of the Scuttlebutt.